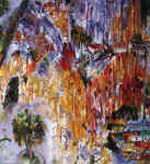 The Principality of Monaco and the Riviera is, after Paris, the region where artists have traditionally chosen to live and work. It has attracted major painters from early in the nineteenth century thanks to its mild climate and accessibility to major European capitals. 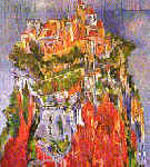 Matthew's paintings of the Principality of Monaco show the Monegasque landscape with its red-tiled houses, the Rock set against the clear blue of the Mediterranean sea and the sculptural forms of the medieval fortifications. The Monaco paintings presented in the collection began life as a sequence of drawings. The paintings in the Monaco Mon Amour series show the spontaneity of canvases painted outdoors directly in front of the subject. 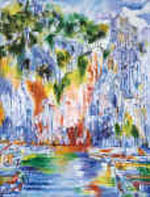 The large and magnificent canvas Monaco Mon Amour was the centerpiece of Matthew Moss' landmark exhibition of the same name held in Monte-Carlo in the Fall of 2003. 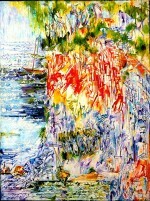 The wild coastline of Monaco, her multicoloured cliffs gleaming in the brilliant sunlight of the Riviera. The imposing 19th century building emerging from the romantic rock face of Fontvieille, the port of Monaco. 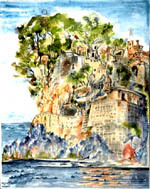 Watercolour done by the artist early on a spring morning with the moon still visible over the ramparts of the fortifications of Monaco. Fishing boats and yachts mingling together in the old port of Monaco. 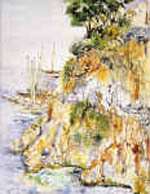 the yachts' tall masts pointing in the direction of the cliff face's rich pink surface. Trees, flowers and old red-brick footpaths emerging from the ancient battlements surrounding the Principality. 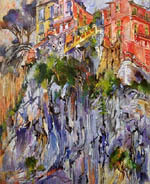 An elegant 19th building (the prince?s palace), perched over the multi-coloured craggy cliffs of Fontvieile. 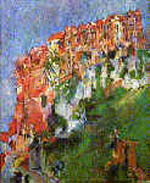 Preliminary study for Monaco Mon Amour. The spectator sees a mysterious hanging garden suspended in time and space. There is the hint of a brooding storm from the water vapour rising from the blue Mediterranean sea.See (1789-11). Emerging from the fortified ?Rocher? 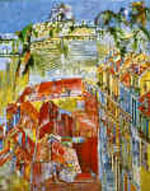 the walls of old Monaco frame the rose, cream and light ochre coloured houses of the city's ancient buildings. 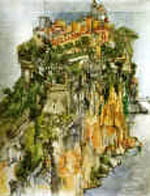 Shows its Bel ?poque buildings perched on the rock, adorned with balconies, terraces and green shuttered windows. Shows the massive cut stone bulwark of the ancient city walls. 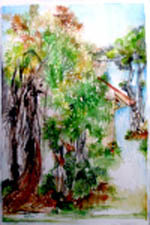 Surrounding trees and foliage, emphasize and frame the protective nature of the imposing structure. The rich colour of Monaco's cliffs and rocky promontories, four yachts ride the choppy waves while the playful shapes of Mediterranean pine trees are perched above. Draft winds guide the kite flown by the boy, standing below the rockface of the Principality, up into its fissured surface. 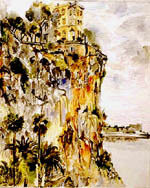 The fortified walls of the Rock covered in foliage and crowned by majestic palms. 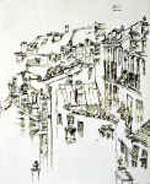 It is the background to the old, fin-de-si?cle buildings of rue de la Turbie. Embedded in the greenery that graces the crown of the Rock's defenses. 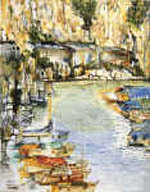 Richly painted sailing and fishing boats lying in the shadow of the cliffs of Fontvieille. Some details of Monaco zoo are just visible above. 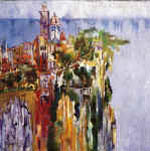 The ancient town of Monaco, perched on its famous Rock; in the background the dark ultramarine blue of the sea is visible. The fortifications of the medieval town of Monaco. Below the fortified citadel some 19th century buildings, show their red-tiled roofs. In Sailing boats below the cliffs of Monaco. the artist's use of calligraphy and the composition of this work of art evokes the ancient masters of classical Chinese painting. 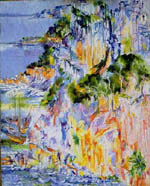 Watercolour showing the beautiful and multi-coloured facets of the cliffs overlooking the Mediterranean at Fontvieille, the port of the Principality. 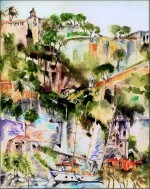 The ancient port of Monaco seen through a rainbow of Cobalts, Cerulean blues, Cadmiums, and Olive greens. 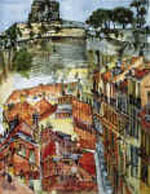 Tiled roofs in a jumble of varied shapes and forms from which sprout numerous chimney pots resembling many roof-top Brancusis. Ancient tropical tree guards the entrance to the Principality of Monaco. 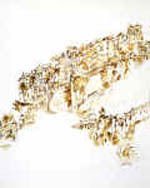 The final version of the painting is based on a number of sepia drawings and watercolours including 0704-001(above). This view of Fort Antoine was possible thanks to the construction of the new port of Monaco. 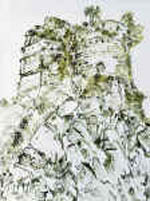 It allowed the artist to view the battlements, for the first time, from a new perspective. 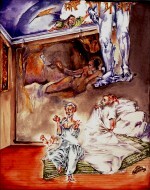 See also the 'rollover' on the Artists Studio home page. 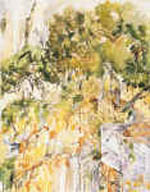 This is the painting of a magic garden. In place of Alice in Wonderland we see, instead, an artist (maybe Matthew Moss himself?) 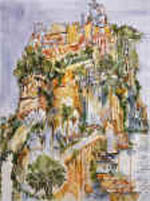 seated and painting an enchanted garden, jagged forms and lines of sheer cliff faces covered with trees and bush and agitated Ligurian seas below the ancient citadel of old Monaco, in a place called Pointe St. Martin. 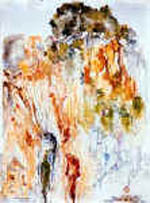 The different preliminary watercolours* the artist made before creating the painting were done in-situ. 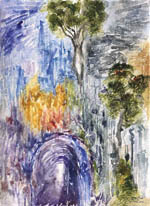 The style of the painting evolved as, gradually, the artist translated the technique of watercolor into the medium of oil painting; this is a mechanism that scholars and his contemporary critics noted J.M.W.Turner used frequently. As he began the final work on canvas Matthew adopted a more schematic style translating the cliff face's soft rose, ochre and grey watercolour tints into oil-based cadmium red and chinese vermilion pigments. As was inevitable, the soft naturalistic style of a work of art done outdoors mutated into a a different type of canvas, one that was stylised, more abstract albeit keeping some of the scene's realism. 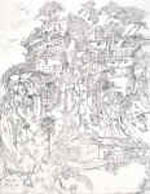 Matthew's painting is a fairly faithful rendering of the underlying rather precise and compete preliminary charcoal drawing that the artist composed directly on the canvas. Apart from some photographs taken during the creation of the painting* the underlying drawing is concealed for good, sadly, somewhat like the 'Sinopia' sketches you find beneath Italian Renaissance frescos. That is, unless some future forensic art scholars decide to bring it to light. This is a view of Monaco's old port where the local fisherman berthed their fishing vessels long before the yachts began to be a prominent part of the landscape. 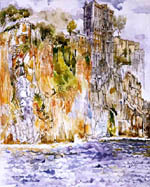 The watercolour is a lost image because the point from which Matthew Moss painted the scene, the boats nestling in safety below the cliff face and fortified walls of the old part of the Principality of Monaco, no longer exists. 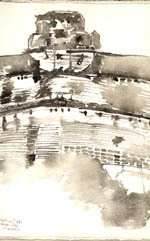 The contemporary landscape painter has, today, much in common with the archaeologist; trying to record or save an image or a site before the builders move in to obliterate the scene forever. 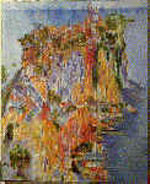 The old stone walls that marked the entrance to the port of Monaco on which Matthew sat one early Spring to record this image of the port and the old town was demolished shortly after the work of art was completed. 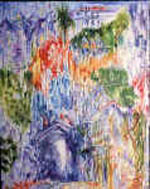 If you go to http://artmontecarlo.com/studio_rembrandt.php you will see that this painting forms the landscape background to at least two of the 'Adventures of Rembrandt' paintings in the series. 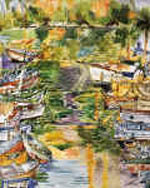 FLORA IN A MONACO MONTE-CARLO SEASCAPE is a delicate work of art that shows the human figure in a beautiful and nostalgic Mediterranean landscape. 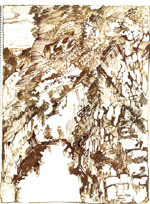 Two strong influences in the artist's conception of this composition are the theme of figures imbedded in a landscape inspired by the Nicolas Poussin’s, 'Landscape with Hercules' Puskin Museum, Moscow circa 1649-51* and the technique used by the Japanese ink and brush (sumi-e) painter Sesshu Tōyō who was working in the 2nd. half of the fifteenth century. 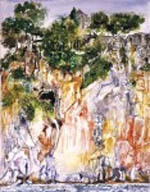 His technique, developed from contemporary Chinese painting, tried to depict the actions of everyday life and people going about their business set against the background of majestic landscapes. 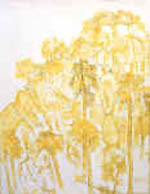 Matthew Moss shadows both painters in this vertical shaped panorama. 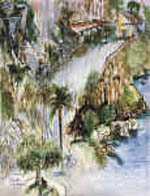 The artist's view of Monaco Monte-Carlo shows, in the upper left background, the mist-covered hills overlooking Monaco Bay and Cap-Martin. 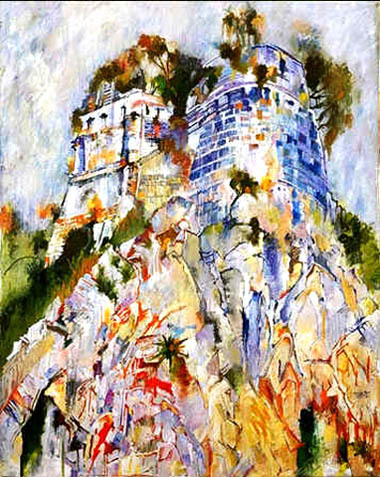 The landscape is dominated by the majestic Tête de Chien rock formation overlooking Monaco with, below, the Prince’s palace and the impressive walls of the ancient city that the artist has painted in tints of rich red and yellow ochre. We can see the Oceanographic museum, built into the massive cliff face with the sea beneath. To the left is the Plage des Pêcheurs (fishermen’s beach) hidden beneath the rocks and the prison of Monaco. The beach is dominated by a wrecked timber fishing boat beached on the pebble-stoned strand being examined by curious fishermen. 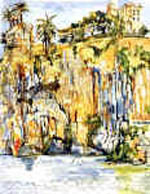 The five figures owe their inspiration to a watercolour sketch Matthew had painted many years previously on a visit to the island of Madeira. 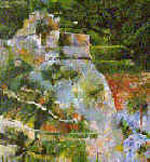 This section of the composition is detached from main body of the composition by the ragged white-foamed waves beating powerfully against rocks that cut the left part of the painting. 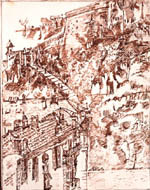 However, on the bottom right, below the cliff-dominated medieval Monegasque city is the early eighteenth century Fort Antoine. The cut stone fortification completes the composition being the backdrop to the figure of Flora the flower-crowned goddess of Spring and abundance dominating the foreground. This recent oil painting by the artist shows the fortified medieval walls of the Principality of Monaco. In the foreground is the boat in which the legendary S.Dévote, the patron of the Principality, was washed up on the coast of Monaco. 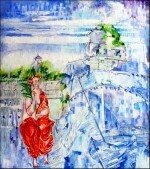 S.Dévote is shown seated to the left of the City's walls, holding in her hands the palm of a martyr. The painting is a development of the artist's interest in creating the theme of a female figure in the landscape, a subject that had its origins in European Renaissance painting with Giorgione's 'La Tempesta.' 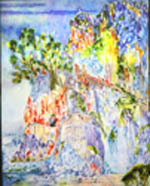 The legendary figure of Saint Devote, associated with the landscape of Monaco proves an ideal theme for the artist.